Rose Quartz necklace 16 inches long made with faceted rose quartz rondelles. 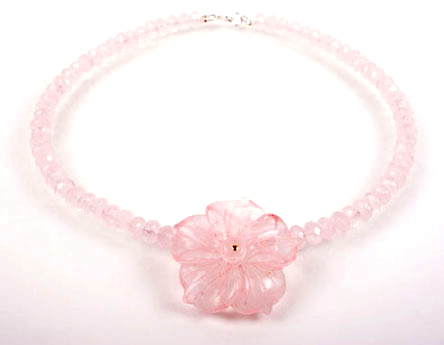 The necklace is completed with a beautiful 40cm Rose Quartz carved flower as a centre piece. The faceted stones in this necklace reflect the light beautfully. Can be worn alone or with the matching bracelet. ©2019 Mai Mai Jewels & Accessories Ltd. All rights reserved. Web Design by BoutiqueMama.